Column: What happens if No. 1 Alabama loses to Georgia? ATLANTA (AP) — If Alabama wins the Southeastern Conference championship game, there’s little suspense. Nick Saban’s dynasty — probably the greatest in college football history — heads back to the College Football Playoff as the No. 1 seed and an overwhelming favorite for its sixth national title in the past decade. But what happens if the Crimson Tide loses to No. 4 Georgia ? That’s where things could get very, very interesting. Alabama has clearly been the nation’s best team since the first week of the season, a juggernaut on both sides of the line with Heisman Trophy winner-to-be Tua Tagovailoa guiding a dynamic offense to go along with another of those typically stout Saban defenses. The Crimson Tide’s closest game so far was decided by 22 points. The average margin of victory is a whopping 35 points — the sort of numbers that put this group firmly in the discussion for best team ever. But No. 4 Georgia is no slouch. The Bulldogs slipped up once this season, losing badly at LSU, but they easily dispatched their other 11 opponents to earn another shot at Alabama, the team that beat them in last season’s dramatic national championship game . While Alabama is a hefty 13 1/2-point favorite, it’s not beyond the realm of possibility that Georgia could pull off an upset. That scenario would be a nightmare for the selection committee, which would have to award Georgia one of its four coveted berths but would be hard-pressed not to give one to Alabama as well — especially if it’s another tight game. For those suffering from SEC fatigue — see: the rest of the country — that would be hard pill to swallow. Three playoff spots are almost surely accounted for: the Alabama-Georgia winner, No. 2 Clemson and No. 3 Notre Dame. Clemson has to go through the formality of playing the Atlantic Coast Conference championship game Saturday night , but that shouldn’t be a problem against 27 1/2-point underdog Pittsburgh. Notre Dame made its case by wrapping up a 12-0 regular season last weekend . If Alabama wins the SEC title, the fourth spot should go to either No. 5 Oklahoma or No. 6 Ohio State. Oklahoma faces Texas in the Big 12 title game , giving the Sooners a chance to avenge their only loss of the season. Ohio State takes on Northwestern for the Big Ten title , coming off a dominating win over Michigan that helped cover the blemish of that stunning loss to Purdue earlier in the season. But an Alabama loss could bump both from playoff consideration, no matter how impressive they look in their conference championship games. It’s hard to envision any scenario where the Tide gets left out. Remember, it was only last season that top-ranked Alabama suffered its first loss against Auburn in the regular-season finale, knocking the Tide out of the SEC championship game. Then, after watching from the sideline as Georgia beat Auburn for the conference title, Saban’s team landed a playoff invite anyway. The Bulldogs did, too, making the SEC the first conference in the playoff era to take up two spots. While there was plenty of grumbling about the SEC getting favorable treatment, it was hard to argue with the committee’s logic. Ohio State won the Big Ten title, but the Buckeyes had a pair of losses on their resume. The Pac-12 had no one of consequence. Central Florida barked loudly about deserving a chance with its perfect record, but no one in their right mind thought the Knights were a better team than the Crimson Tide. Alabama backed up the committee’s decision by cruising past Clemson in the semifinals , setting up an all-SEC national championship against Georgia. That game was one of the ages, the Tide rallying from a pair of 13-point deficits to beat the Bulldogs 26-23 in overtime on Tagovailoa’s 41-yard touchdown pass. If Alabama stumbles again, it might tougher to give the Tide a second chance — especially if Oklahoma and Ohio State both win impressively. But the committee has shown its willingness to overlook Power Five conference champions in favor of what it views as the stronger team, also picking Ohio State in 2016 even though the Buckeyes didn’t even quality for the Big Ten title game. (That one didn’t work out so well; Ohio State was blitzed by eventual national champion Clemson 31-0 in the semifinals). 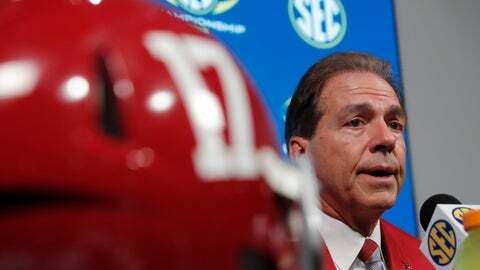 Saban shrugged off any speculation about his team’s playoff future during Friday’s final news conference before the SEC championship game. Sankey tried to make a case for his conference deserving two teams in the playoff — no matter who wins Saturday. Sorry, commish, now you’re just getting greedy. You’ll probably get your wish.